Crush the mixed beans in a bowl and mix with the breadcrumbs, chilli powder, coriander, 1 egg and seasoning. Split the mixture into 4 and shape into burgers. Grill the burgers for 5 minutess on each side until cooked through. Split the bread rolls and spread the top of each with 1 tbsp of tomato salsa and 1 tbsp of guacamole. 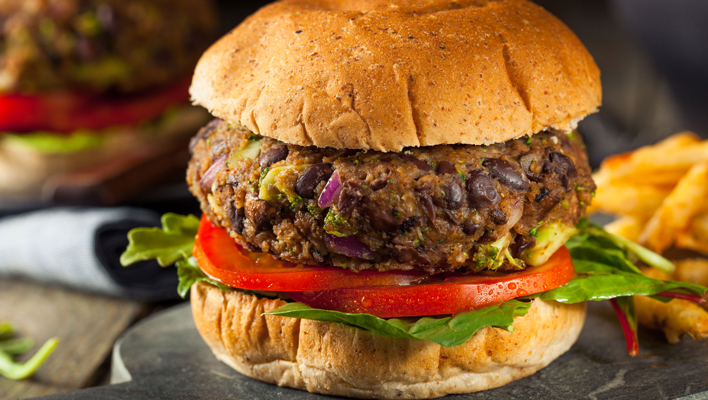 Place 1 lettuce leaf and 2 slices of tomatoes on the bottom and top with the bean burger. Serve and enjoy. Mix the beans, avocado, tomatoes and salsa together. 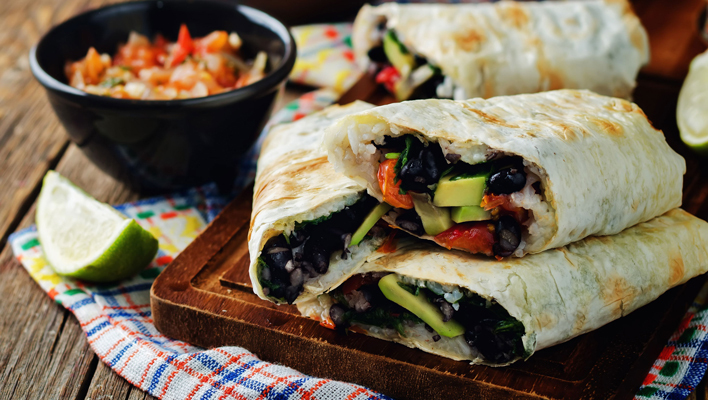 Divide the mixture between each wrap and roll tightly. Place under the grill for a few minutes on each side until the wrap starts to crisp. Serve. Place the turkey and onion in a large non-stick pan over medium heat. Cook, breaking up the meat with a wooden spoon, for about 10 minutes until cooked through. Transfer to a colander to drain off any excess fat, wipe out the pan and return the meat. Add the tomatoes, cumin, chilli powder and oregano. Cook over medium heat, stirring occasionally, until most of the liquid has evaporated, approx 3 to 6 minutes. 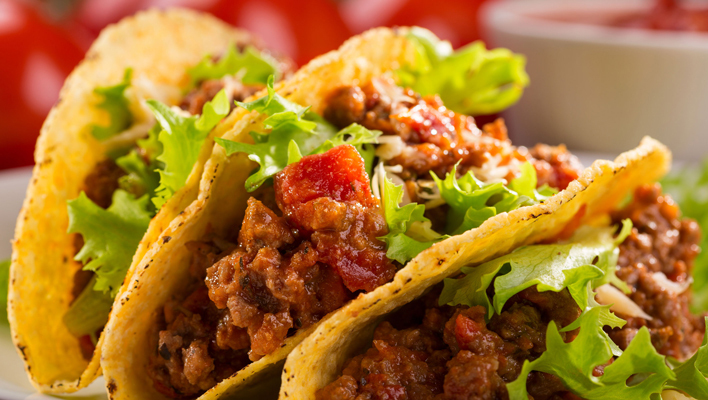 Serve in taco shells topped with lettuce and salsa. 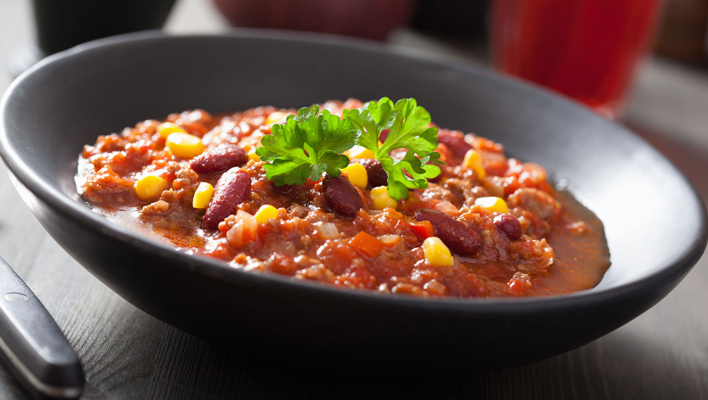 This is a great recipe for a slow cooker. Add the chopped tomatoes, kidney beans, borlotti beans and chopped onion. Top this up using the water. Add the chilli powder, ground cumin, salt and pepper – stir well. Cook on a low heat for a few hours. Serve garnished with parsley. Pre-heat the oven to 190°C. Brush both sides of the tortillas with olive oil and cut into small triangles. Bake in the oven for 10 minutes, turning half way, until starting to turn golden. 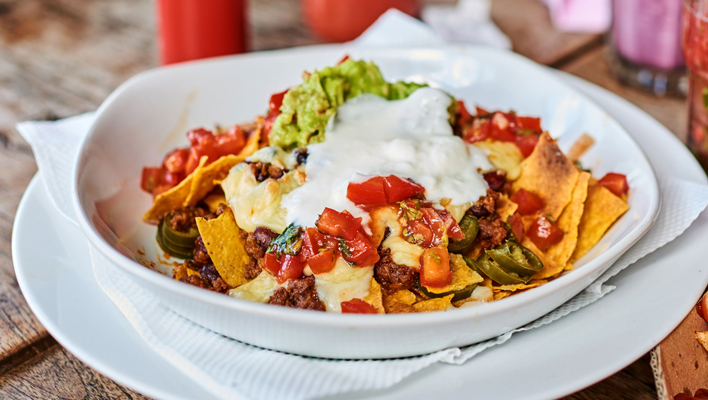 Place the tortilla nachos in two bowls and divide the topping between each – first spoon over the bean chilli, then cheese, half the chopped tomato and half the jalapeno slices, top with guacamole and greek yogurt.